I’ve only seen the show on some periscope and quickly going thru the video. It looks like a good show, a show which would be favorable reviewed if it aired on ClaroSports, though lacking the super memorable match you’d expect for a major CMLL show. The main event was much shorter than a normal mask match, felt like a match they’d had been rehearsing for weeks (but without the ability to shake the unnatural feeling.) It was worked more like a normal CMLL big match, with suplexes in the place of flying moves, and the only abnormal bits being the brawl outside the ring of outsiders right before the finish. I have other commitments this weekend, so I might not get a recap up for a few days. Pierroth’s age is iffy; there’s been indication he’s in his 50s previously. For what it’s worth, when he lost his mask as Poder Mexica in 2002, magazine articles reported his age as 33. That’s consistent with being 48 now, so he’s either telling the truth or has been shaving off years for a long time. +LuchaTV has video from the post show interviews with Diamante Azul and Pierroth, who mostly has Rush talk. They made it clear this feud isn’t over (expect a month of rematch) and Azul wants Rush next. CMLL’s recap of the show ends with the thought of Rush going for revenge. I don’t think that match is happening any time soon or at the Anniversary show, just because CMLL likes to switch around who’s featured, but I guess we can’t rule it out. This was the fourth of five big shows with a Los Ingobernables main event and there’s not many other options on hand for the next one. The option I think most people want is Atlantis/Rush, but tonight gave CMLL reason not to bother to do that. Tickets were at last year’s Anniversario level (cheaper the ones before it, but still not that cheap) and attendance looked to be 80-95% depending on the view. The turnout was boosted by the part of the fanbase which only comes to the big shows; they may boo Mistico (they did here!) and they may have booed after the main event, but they keep on coming to these shows and it’s a success of a branding. There were groups and bunches of empty seats visible on the floor, which probably means the scalpers were the real losers on this show and CMLL still got paid. This night, this main event, worked out for CMLL. This seems a little bit of a depressing deal for people who like good matches with big names; if CMLL can get a big gate with an obviously problematic match like Diamante Azul versus Pierroth, then there’s less reason to try for anything better. There’s a positive flip side to this though: Pierroth meant nothing in CMLL nine months ago before they ‘revealed’ him to be Rush’s father and threw him into the Los Ingobernables despite bringing nothing to the table. If CMLL can do go all with Pierroth and make it work, they should realize they can do it even easier with actually talented people. It does not take years for this fanbase to take to a luchador, it takes a promotion putting in the effort to treat him like a star. There was a minor controversy over Villano V being upset he and Villano IV weren’t invited to the ceremony honoring Villano III. If CMLL had told them they were invited and then changed their mind (which is a little bit implied), that’s not a good thing. But, in general, I don’t think you need to honor the other Villanos every time you honor Villano III. Villano III was a really big star who deserves to get all the attention for himself and not have to share it with his brothers every time. There also might be some politics, since Villano IV is working with AAA – but then, the Villano III son who did the La Llave de la Gloria tryout was part of the ceremony, so maybe not. CMLL put up the iPPV quickly after the show, much quicker than the Anniversary show. It’s the same price, $3USD, and the same rules: it’s a rental, you’ve got 30 days to start watching after you buy it, but only 72 hours to finish watching it once you’ve started. Just don’t buy until you want to watch it, if you’re going to watch it. The YouTube text indicated they actually broadcast the show as a stream, the same they run Mondays and Tuesdays, but just kept it private until after the show. It’s a pretty simple solution, they just had to wait for YouTube to finish processing the video. I believe they have to manually add a price for each country. You can try asking them to add your country via Twitter of Facebook, though there’s no sure bet they’ll do it. It also appeared not to be accessible on mobile last night, which may be a YouTube thing. The Arena Lopez Mateos show last night was headlined by AAA luchadors, and AAA says it was a full house. In the undercard, Hetzza won an elimination match of WWS luchadoras, and won a trip to Japan for Stardom for three months. I know little about her except she was interviewed two months ago about her dream to go to Japan. 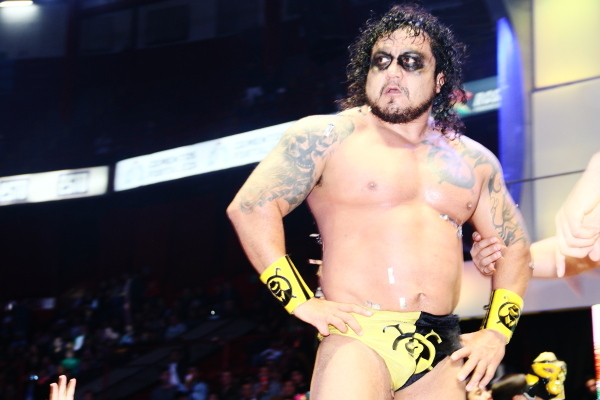 Pimpinela was the surprise luchador on Thursday’s AAA show in Arena Aficion, which brings up the possibility of her being the surprise for the Rey de Reyes’s women’s match. It would be a waste of a chance to have a good match with Taya if they put Pimpi in, but it’d get a reaction, and AAA leans more to getting a reaction than to having a good match. I wrote a preview of Rey de Reyes over at Voices of Wrestling. It’s not a good card, not something we’re missing out by seeing live. I assume it was put together after La Rebelion left but before the new direction, but it’s a complete mess of a big lineup. They should do fine in Monterrey, but it wouldn’t do a lot as a iPPV and they may be better off not bothering with it this time. They’ve got other problems to fix first. Tonight’s Arena Coliseo show has Matt Taven, Volador and Stuka vs Hechciero, Kraneo and Ripper. DTU is running in Arena Coliseo San Ramon in Puebla. Lucha Libre Boom has a show in Mexico State. Martinez in Texas has ACH vs Daga with Konnan as a guest. Lots of Mexican luchadors are in Puerto Rico for a show. SuperLuchas writes about Villano III vs Atlantis, reprints a 2009 award winning article about Villano III and the first episode of Lucha Underground from Mexican TV production eyes. Back to normal. Azul & Pierroth go on. (Pierroth is going to keep using Pierroth. There were rumors of him dropping the name – and the obligation to pay the original Pierroth – once he lost his mask, but he said he’d continue to be using the name.) We do get see Dragon Lee versus Niebal Roja, but only in lightning match form.